Among their several new lines of Haswell ultrabooks, Sony launched the Vaio Duo 13 as well. We’ve tested their previous Vaio Duo 11 a while ago and there were a couple of things I didn’t like about that particular laptop. The 13 inch version promises to fix many of them, while boosting a brand new Intel Haswell hardware platform and some nice Sony tweaks. 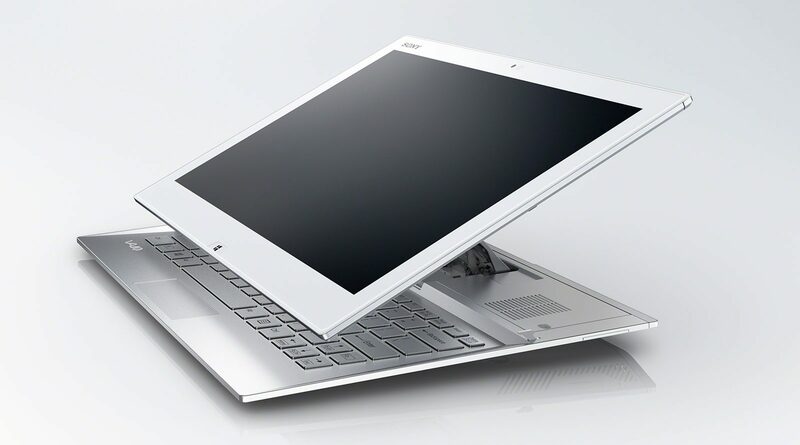 Still, the Sony Vaio Duo 13 is among the first Haswell ultrabooks you will be able to buy, hitting the sores on June 9th. The first reviews for this unit are in and unlike the Vaio Duo 11, the 13 managed to score good marks. Those being said and given the features bundled by this machine, I believe the Duo 13 is among the most interesting new ultraboks of the moment. You’ll see why below. For starters though, check out the list of specifications, so you’ll know exactly what we’re talking about here. Alright, so there are several things you should notice from the specs. First, this ultrabook runs on Haswell hardware, and you’ll be able to choose between some i5 and i7 configurations, all with different graphics. The Intel Core i5-4200U processor is bundled with Intel 4400 graphics, which is basically a GT2 chip, as Chippy noticed here, so it shouldn’t be much faster than the Intel 4000 chip used on most Ivy Bridge ultrabooks. The Intel i7 option however will offer 5000 graphics, part of the new GT3 family, that promises twice the performances of the 4xxxs lines. We’ll see. 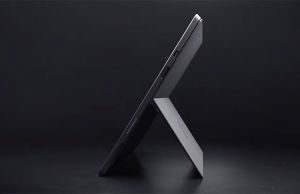 Then, you should notice that the Duo 13 is not a lot larger than the Duo 11 and only less than 0.1 pounds heavier, and that’s because the Duo 11 was quite beefy by itself (for an 11.6 inch machine), with thick bezels. That’s why the Duo 13 doesn’t feel a lot bigger and should be quite comfortable to use. Yes, it’s still a 13 inch machine and weighs about 2.9 pounds, so it doesn’t feel like an iPad or other tablets, but it’s not that bad either in tablet mode, especially if you want to have an all-in-one device. Because that’s what the Sony Vaio Duo 13 is. An all-in-one mini laptop. 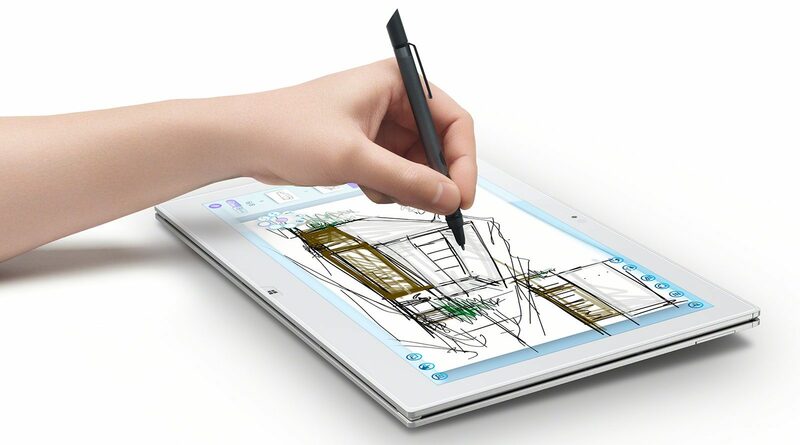 You can use it as a tablet, or as a notebook. Sliding up the screen reveals a decent sized keyboard and a tiny touchpad. Yes, the Duo 13 is still a slider, and that means you can’t adjust the viewing angles, but for the average user that might not matter that much. And the sliding mechanism actually looks quite cool, plus was improved from the one on the Duo 11. It’s called the “Surf Slider mechanism” now and feels more solid, while works far smoother, based on my brief experience with this unit. Then, there’s the screen. 1080p IPS touchscreen, so nothing fancy, but.. it bundles Sony’s Triluminous technology, which basically makes the colors pop out of the display. The panel is also very bright and offers good contrast and viewing angles, which were a must, given how you can’t adjust the screen’s inclination. But I for one do find this display a bit too over-saturated, too punchy for my liking. Think about the popping colors on the AMOLED screens of the Samsung Gaalxy S3/S4 phones, that’s basically what you’re getting here, and not everyone will enjoy that. Another thing I noticed in the several reviews available already for the Vaio Duo 13 is the impressive battery life. I wasn’t happy with the Duo 11 on this front, and while it seems like the battery isn’t a lot larger on this 13 inch unit (we’re probably looking at a 50 Wh battery, given the size and weight of this machine), the laptop can easily go for 9-10 hours of average use, according to Engadget. Which, if it really proves to be true, is astonishing. 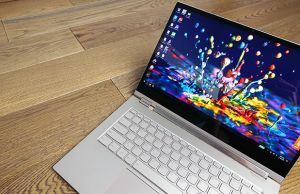 Sony does bundle the Duo 13 with what they call Active Sleep, which does sound a lot like Intel’s Connected Standby technology, that lets the laptop update while in sleep mode, so you’ll have all your emails and notifications updated when you’ll open your machine. Given how the laptop can not last for many days in sleep mode and resumes from sleep in about a second, that gives you little reasons to ever shut-down your device from now on. 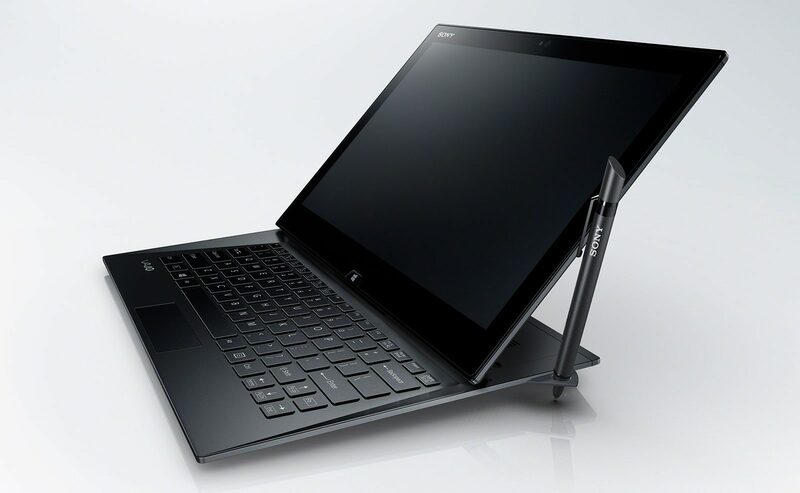 Like I mentioned in the beginning, the Sony Vaio Duo 13 will hit the stores on June 9th, 2013. The base version, with an Intel Core i5-4200U processor, 4 GB of RAM and 128 GB SSD starts at $1400. You can also configure several other version of the Duo 13, the top option, with an Core i7-4650U, 8 GB of RAM, a 512 GB SSD, LTE and Windows Pro going for about 2700 USD. All versions can be found slightly discounted though, as you’ll see from this post. There’s probably one reason why you’d buy the existing Duo 11 over the new Duo 13 right now: the price. I’d expect the 11 to drop in the next months, maybe to around $1000 or so, and since the 13 starts at $1400, you might want to save some money and buy the smaller version. Smaller is not really the right word here though, as the two are pretty much the same size and weight, despite the new model sporting a larger screen. And then there are plenty of improvements on the 13: faster hardware, longer battery life, better screen, better Sliding mechanism, roomier keyboard and a trackpad and so on. Of course, if Sony decided to update the Vaio Duo 11 somewhere down the line and make a more compact option, then all these words in this chapter won’t have ground anymore. But until then, get the Vaio Duo 13 over the 11, it’s clearly the better option. 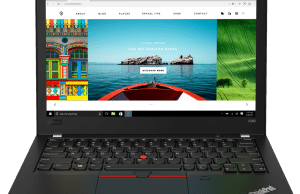 Wrap up – should I buy the Vaio Duo 13? I’ll hold off on answering this until a get to play with the Vaio Duo 13 for a bit longer, hopefully in a week or two. But, don’t be hasty if you can, this is just one of the first Haswell ultrabooks to hit the stores, many more will follow by the end of the summer. And I’m pretty sure most of them will be cheaper than this Sony. Still, if you want a new ultrabook right now, don’t mind paying the premium price and need some of the fancy features offered by the Vaio Duo 13, like the pen/digitizer, the LTE support or the convertible form factor, you won’t go wrong with this one. You should still check out my list of the best ultrabooks of the moment and my list of top hybrid ultrabooks, you might find some very interesting options in there as well. Those being said, I hope to have a detailed review for the Duo 13 very soon. In the meantime, let me know what do you think about this laptop, what you like about it and what you wish Sony would have done better. ← Previous Story Sony Vaio Pro 13 vs Pro 11 – which one to choose? I think the Sony Duo 13 is a great laptop/tablet.. But the stylus is seriously flawed: ergonomically you can’t find the right-click button; there is a second, larger, totally useless button that you will hit by mistake; the buttons are not reprogrammable; sometimes the right-click button won’t do what it should so you have to use the touchpad; and there is nowhere to store the stylus. Don’t clip it with the pen-clip Sony provide: the clip will break. And Sony will ask you to send the entire computer back to them so they can change the stylus clip. The stylus is an absolute disaster.